Watch highlights as Sebastian Vettel dominates an incident-packed Singapore Grand Prix to take his third win of the season. 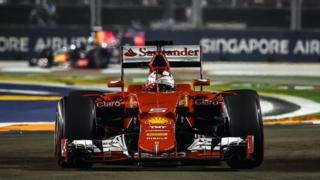 Vettel led from lights to flag to earn his fourth victory around the Marina Bay street circuit, while a throttle problem forced Lewis Hamilton out and reduced his championship lead. Daniel Ricciardo finished second for Red Bull and Kimi Raikkonen third, making it the first in 2015 both Ferraris have been on the podium.